Millennials define the workplace diversity phenomenon in a surprisingly novel way. Moreover, it influences their sense of teamwork and their productivity. That’s not something to be ignored, to be sure. By 2025 millennials will cover nearly 3 quarters of all jobs. Workplace diversity has long been an issue. A century ago it sounded like the recipe for a disaster. In the meantime, it has become the recipe for success. What changed? Two world wars, globalization, social movements and emancipation. We live in a very different world today. And change is accelerating, without a doubt. Yet a lot of “yesterday” drags into “today.” And tomorrow seems as far as it is close. Soon we’ll have a colony on Mars. And 3D printing construction robots will build structures on the Moon. But somehow women make up just 15 percent of NASA’s teams. And things are worse when it comes to other types of diversity. So, the issue today is what diversity really is. And that’s precisely the challenge. Because the 20th century defined diversity as one of equal opportunity. Post-war social movements and political participation: equal work, equal pay. And these issues echo to the present, in a myriad of ways. Meanwhile, millennials have a different understanding of what workplace diversity means. And why it matters. We are truly experiencing a radical transformation of diversity and inclusion. Deloitte did a study on inclusion and perceptions of inclusion. Here are some awesome highlights on what millennials believe about diversity. Subsequently organized around key issues. In short, the study covers how different generations understand diversity. Concurrently, it covers how diversity influences productivity. Correspondingly, it reaches key conclusions about team engagement. When defining diversity, millennials are 35% more likely to focus on unique experiences. Meanwhile, 21% of non-millennials are more likely to focus on representation. This makes perfect sense. Millennials grew up in a culture in which representation was becoming less of an issue. Moreover, they are the first to witness solutions for representation. Hence, they take representation as a given. As a result, lack of representation leads to indignation. The new diversity issue is becoming one of experiences and ideas. Millennials are more interested in team members with novel experiences. And they believe that such experiences are valuable to a team. So, your semester abroad now matters. In similar fashion, so does your experience with volunteering. When asked about the business impact of diversity, millennials reacted favorably. In fact, millennials are 71% more likely to focus on teamwork. Meanwhile, 28 percent of non-millennials focus on fairness of opportunity. In other words, most millennials pursue team diversity. Obviously, teamwork is a key focus of millennials. We do live in a new age. One that connects people. Everywhere. All the time. People passioned about active participation, above all. Gone are the days of individual progress. Meanwhile, what’s left is sharing your perspective. What makes you different. Your individuality. What millennials care about is that new team members, no matter the background, are able to work in a team. And add extra value through experience and different perspectives. Which in turn leads to increased productivity. 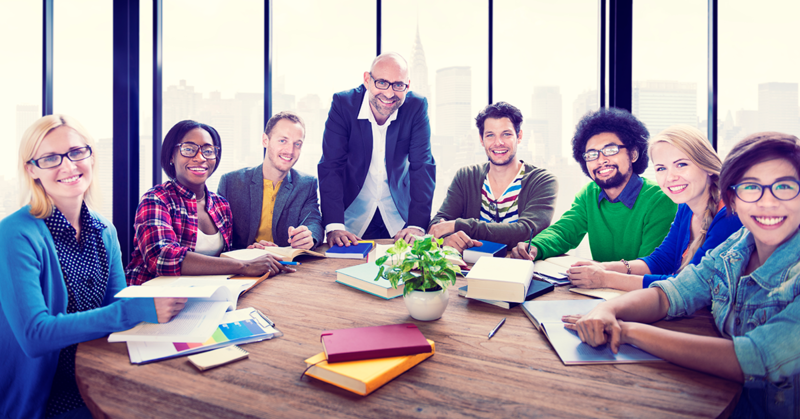 Millennials believe that workplace diversity means enhanced productivity. Non-millennials would still focus on fairness of opportunity and just that. But fairness of opportunity is less of an issue. Not that we should take fairness of opportunity for granted. After all, that’s what the previous generations fought for. However, today’s change and progress is subtler. And all organizations should offer training in diversity and multiculturalism. Organizations that foster inclusive cultures have a lot to gain. 83% of millennials become actively engaged in inclusive cultures. Comparatively, the percentage drops to 60% when the opposite holds true. Indeed, a significant difference. Companies that don’t promote diversity miss out. This is in no way surprising. Because we already know that millennials prefer meaningful work. And this means that they prefer working for a good cause. Even when it comes at the cost of a better payment plan elsewhere. Having an inclusive culture at work affects the entire organization. And it’s not just those that feel included.But rather those that feel “including”. Which is obviously understandable. For the most part, teams build cohesion in the effort to be inclusive. Besides, diversity is great in smart meetings. In a sense, workplace diversity fosters intrinsic motivation. Moreover, it helps with employee retention. In like manner, it boosts participation in meetings. Millennials believe in programs aimed at diversity and inclusion. In particular, that they should focus on improved business opportunities and outcomes. And they expect this to be a result of the acceptance of cognitive diversity. Cognitive diversity, specifically, means individualism, collaboration, teamwork and innovation. This is what it all boils down to. Cognitive diversity is workplace diversity. In particular, organizing teams that have a wealth of experiences. People with different backgrounds, different skill sets. And substantially different perspectives. Ensuring cognitive diversity is not that difficult, in truth. In fact, many millennials go through career shifts. Or attempt secondary degrees. Indeed, there are a lot of opportunities for meandering careers. And that’s the future. Imagine a law graduate with a M.Sc. in Cognitive Science and another M.Sc. in Biostatistics. In addition, superb math and coding skills. Moreover, great with digital marketing. Perhaps even music, martial arts and multiculturalism. All built on an ongoing interest in writing, philosophy and community organizing. And the list could go on. Is this a team or a person? Suppose it’s a person. That’s not even rare. Linearity has long stopped being a virtue, career-wise. Now, imagine a team of such people. Each with strong skill sets in several areas. And a trans-disciplinary understanding of a lot of other things. Think of the impact of such a team. And how it caters for innovation. Which is precisely the issue. 21st century workplace diversity is the catalyst for innovation. Workplace diversity is becoming most important to teamwork. In fact, millennials will likely drive it to mainstream. For that reason, measures must be taken today. More on workplace diversity in the second part of this article. And we will go through some research on the topic. And on the benefits of workplace diversity. Also, we will cover a definition of diversity. And we discuss what workplace diversity means. Moreover, we discuss some current challenges. Lastly, we tackle how and why to improve workplace diversity. Don’t forget to check in!